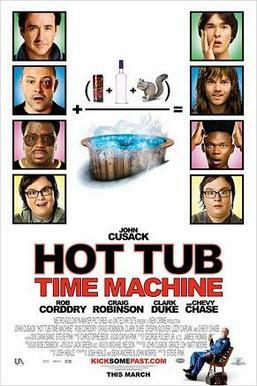 Hot Tub Time Machine is a 2010 American comedy film directed by Steve Pink and produced by MGM/United Artists. It stars John Cusack, Rob Corddry, Craig Robinson, Clark Duke, Lyndsy Fonseca, Lizzy Caplan, and Collette Wolfe. In addition to Cusack, the film also features stars from 1980s films such as Chevy Chase, Crispin Glover and William Zabka. The film was released on March 26, 2010.